Wow! Thanks to everyone who posted (or lurked) last week on how they got into product marketing or product management. There were some great stories. I especially liked TimthePM's blogs on his story and his own survey about getting into product management. "...a deep understanding of both the technology space and the business context, a highly intelligent and strategic mindset, a creative marketing instinct, combined with “six-sigma” execution ability." I'm not exactly sure how anyone measures these attributes, let alone discovers them in a job interview, but this is an ideal view of either role. 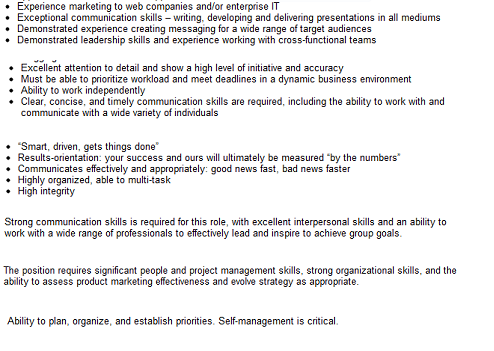 Here is my short list of essential skills anyone in either product management or product marketing needs to have. If you can't put coherent thoughts into readable sentences, then this isn't a career space for you. You have to be comfortable, effective and engaging presenting either in front of small groups - as in a sales setting - or to executives or to analysts or to large groups. Period. This can be either quantitatively or qualitatively, but you have to be able look at all the data you have and make supportable conclusions from it all. Whether it's where leads are falling out of your pipeline (and why) or hearing the third customer say the same thing (just using different words), you have to be able to figure out what it means and take action. Asking questions - and going beyond the obvious answer to the "So what?" or "Why would anyone care?" questions is another core skill. This gets you beyond the popularity contests to the things that really matter to your buyers or market. We were engineered with two ears and one mouth for a reason. Both Product Marketing and Product Management disciplines need to be able to closely listen to what people are saying to hear the truth, what's really bothering them or what's truly important to them. 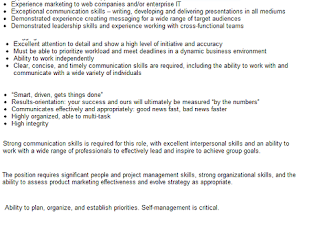 Those are my essential skills for Product Marketing and Product Management. I believe they are applied differently or for different reasons in each discipline but they remain core to being successful. That's my considered opinion. I'd like to hear your views on the subject. And please vote for my session at Silicon Valley Product Camp. Many Thanks! And yet - almost everyone I know in product management has a technical background and not, say, a journalism background (which looks like it might be a good fit given the above list). Here is one thing I will add to the list - they need the ability to build credibility with development and senior management. That's a tricky thing for folks with no technology background to do, particularly if the management team skews technical (as it does in most tech companies). Thanks for the comment. You have an excellent point about product manager skill sets. This is where the roles start to specialize into the different disciplines and PM definitely needs some kind of technical chops to maintain checks and balances with Engineering. This is aso where *experience* comes into the mix and I will write more about that next week. I've faced the same challenge in both PM and PMM roles and it certainly helps that in my career I've managed QA, done tech support, know what third normal form database design is (because I've built some), and had more than passing exposure to both ITIL and CISSP training. There's a reason I don't write code for a living - and I'm happy with that. That background (experience) has been invaluable. However, without the above skills I would not have progressed very far. I would add that you need the ability to prioritize and most importantly to get things done. I also agree with April that you need the ability to convince, not just execs but your peers as well. You can't succeed as a PM or PMM on your own. Thanks for positng and I agree wholeheartedly. Both positions have a component of selling in them. Selling the Sales team on the messaging, the collateral is right, useful and effective, etc. Selling Engineering on the right set of specs. Selling customers on the roadmap, etc. One way to look at it is getting people who don't work directly for you to work for you. That is leadership, selling and management.